At long last the particulars of my Easter sewing marathon. I really need to get a better handle on this time management thing. I'm not really sure how to do that. As I have said before, I can't spend time both here in this chair and at my sewing machine at the same time. If I could cure that little problem I would have it made. Well that is just the beginning of the problems I need to fix. None of those are any easier. 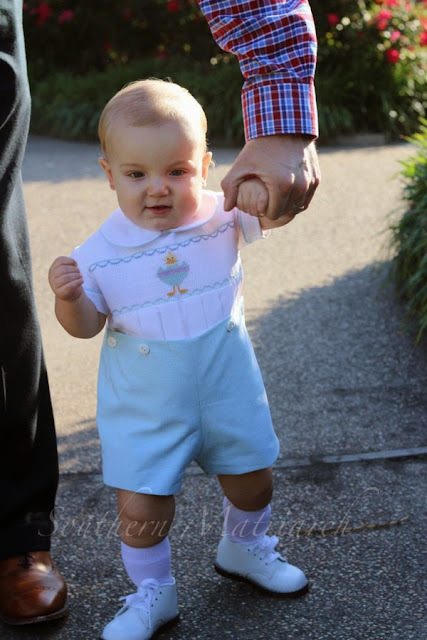 Here is the littlest bit in his Easter button on suit. First off because I have had a couple of emails asking, his shoes come from J-Ray Shoes in Mobile, AL. Best service, hands down! Don't you love those chubby knees? Momma went shopping in the stash closet and came up with this aqua micro check. Perfect color for Easter. A little departure from the usual blue for a little boy. The shirt is white Imperial broadcloth. Thanks Rita for that pleated insert I won as part of the "Pot O Gold" at our chapter meeting. Didn't have to pleat, could get started right off with the fun, stitching. I hate prep work. I am not usually a big fan of finish work either. I want to do the middle parts. The pattern is an oldie but goodie. Children's Corner "David". Available from many heirloom retailers as well as Children's Corner Inc itself. I have not made this pattern since my 31 yr. old son was 2. So a long 29 years. Suffice it to say, my collars and piping have gotten much better in 29 years. This too was Momma's choice. I did redraft the collar to make it a smaller. The smocking plate came from an old Creative Needle. Mar/Apr 1990. Just when you thought it was safe to throw those old magazines out. I actually stumbled across this looking for something else. Isn't that always the way? Momma liked it and we ran with it. 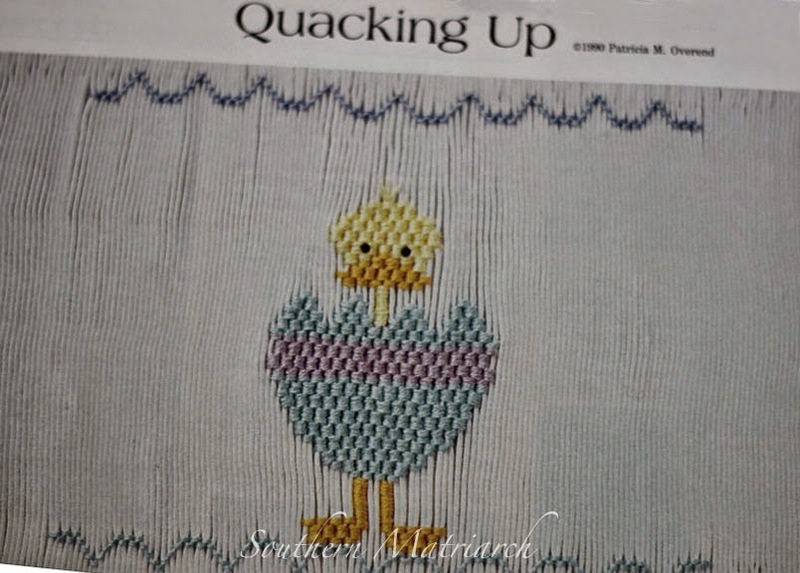 I did smock it with three strands instead of four to make him a tad smaller, and squeezed the borders in for the same reason. If I had been thinking, I would have taken a couple of rows out of his egg to make him even shorter. 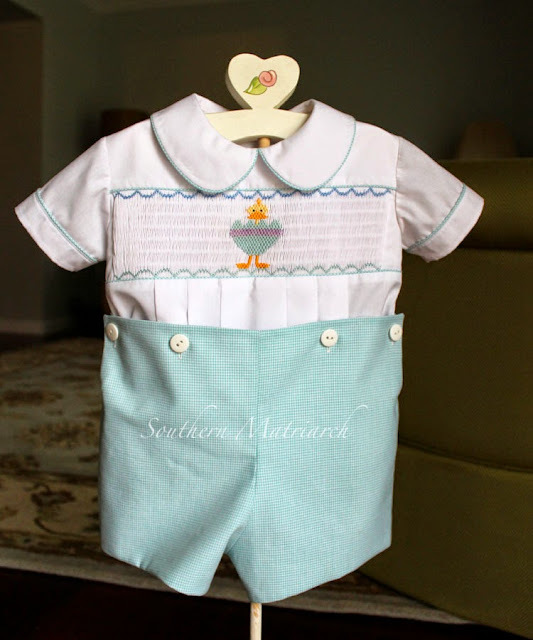 A 9 month old doesn't need 12 rows of smocking across his chest. Excuse the bad cell phone picture of a picture but that is all this Mimi has. 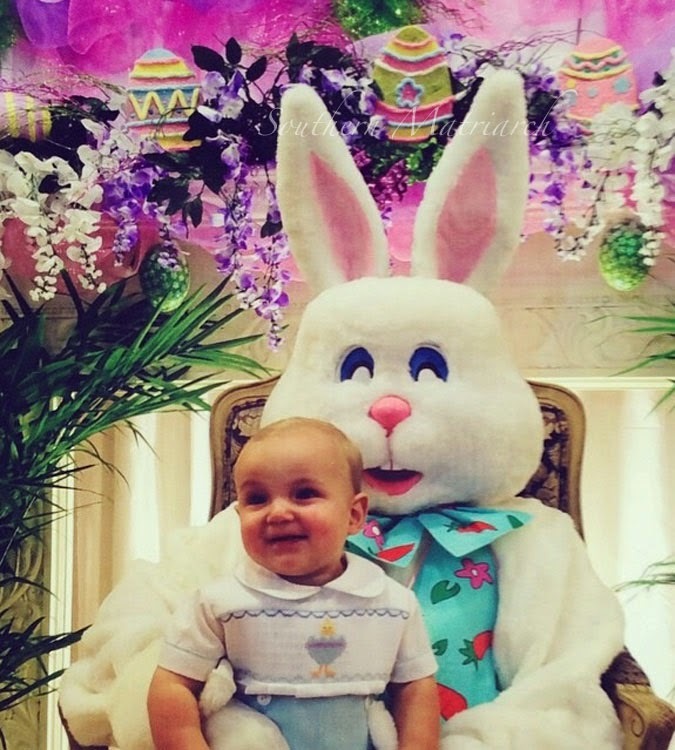 I think he outshines the Easter Bunny in cuteness. Those dimples are just killer. Next up, Wildman. Have you signed up for your Sew-Cation? SAGA's National Convention in Orlando? I have. 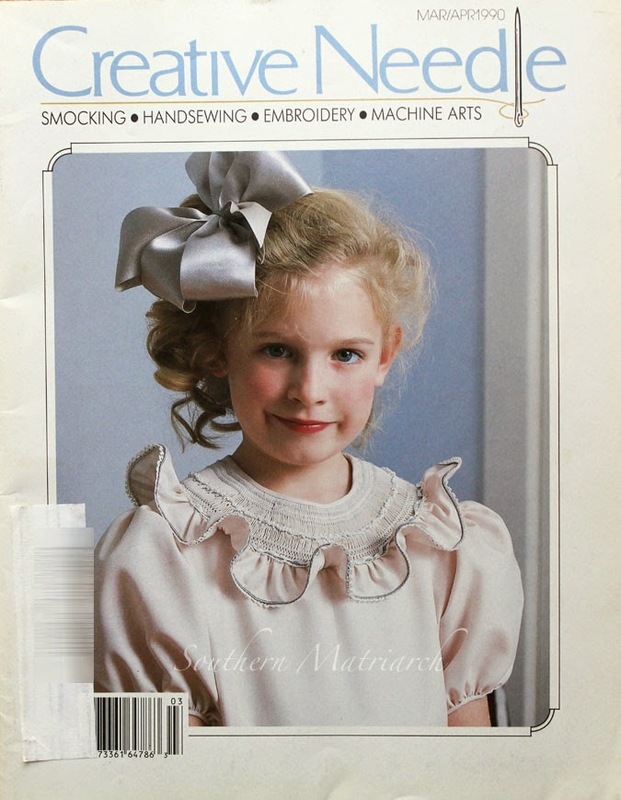 I plan on taking a faggoting class with Phyllis Brown, also her eyelets class, collar drafting with Lyn Weeks, and a redwork class with Jeannie Baumeister. That baby boy is the cutest in his Easter outfit, it fits so well and looks adorable. We are not in one class together boohoo !! Boo hoo is right but at least you will be there to hug your neck. Adorable, Martha!! We always love seeing what you are up to....no matter the delay :).